I was asked to prepare some background information on the importance of delivering a positive customer experience, and I thought I would share some of the research with you. How much does the market reward companies that deliver excellent customer experience? Consider that the Fortune list of the world’s 10 most admired companies in 2013 includes seven that are renowned for excellence in that area: Apple, Google, Amazon, Starbucks, Southwest, Disney and FedEx. The world’s two most valuable brands – Apple and Google – are considered world-class. Dell has published internal metrics showing that 97% of dissatisfied customers can be rescued with proactive intervention and more than 40% of those people actually become raving fans. Siegel+Gale’s 3rd annual Global Brand Simplicity Index reported last year that nearly 1/3 of American consumers would be willing to pay an average of about 4% more for simpler brand experiences. Gartner estimated last year that by 2014 “failure to respond via social channels can lead to up to a 15% increase in churn rate for existing customers.” You have to wonder why one-third of large corporations still block social network use by their employees. Research published by Temkin Group last year reported that only 7% of the 255 large companies it surveyed could be described as reaching the highest level of customer experience maturity, although nearly 60% said their goal is to be the industry leader in customer experience within three years. That’s gonna be a tall order. A July, 2013 Lloyd’s survey of 588 C-suite executives found that customer loss was their second biggest concern, exceeded only by worries about high tax rates. 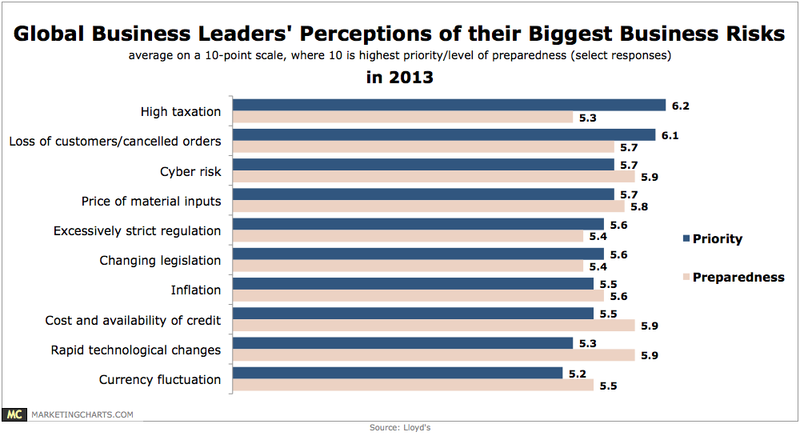 Respondents also indicated they are under-prepared to address this risk, with executives giving themselves only a 5.7 rating on a 1-to-10 scale (see chart below). Sixty-two percent of B2B and 42% of B2C customers purchased more after a good experience, while 66% and 52%, respectively, stopped making purchases after a bad experience, according to a recent survey of 1,000 people who had had recent customer service interactions. The research also indicated that customers are somewhat more likely to share bad experiences through social networks than good ones. Executives talk the talk but still don’t walk the walk. An Oracle survey of 1,342 senior-level executives from 18 countries earlier this year found that 97% agree that delivering a great customer experience is critical to business advantage and results, and that the average potential revenue loss from failing in this area is 20% of annual revenue. However, 37% are just getting started with a formal customer experience initiative, and only 20% consider the state of their customer experience initiative to be advanced. A survey of 2,000 adults last year found that 83% are willing to spend more on a product or service if they feel a personal connection to the company. One-fifth said they would spend 50% more on companies that they felt the company put the customer first. This entry was posted in Attack of the Customers, B2B, marketing, Social Media, social networks by Paul. Bookmark the permalink.